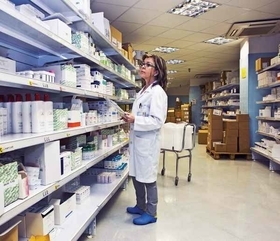 Independent pharmacists in New York are calling for a state investigation into the practices of pharmacy benefit managers—the companies that negotiate drug prices on behalf of insurers and employers. They blame the PBMs for forcing owners to close up shop. Hundreds of members of the Pharmacists Society of the State of New York met Wednesday in Queens to plot how to fight back against the PBMs. The PBM industry is dominated by CVS Caremark, Express Scripts and UnitedHealthcare's OptumRx, which control a combined 72% of the market, according to the Drug Channels Institute. The companies are responsible for reimbursing pharmacies for drugs purchased by customers who are insured or employed by their clients. But they don't disclose how much they are paying for those drugs, allowing them to earn more money if they can force down pharmacy reimbursement. Ray Macioci, who has run Pilgrim Pharmacy in the Bronx since 1976, said he is losing money on some generic drugs because of low payments from PBMs working with local Medicaid managed care plans. To save money, Macioci said, he now closes his store on Sundays and is open two fewer hours per day. He said he is frustrated by the close relationship betweens some PBMs and the chain pharmacies. CVS Health is a behemoth in both industries. "When your competition controls the flow of dollars, and they can turn it off and on at will," he said, "you really have a problem." The pharmacists are hoping to build off momentum in other states to fight the PBMs. A report on Ohio's Medicaid program showed that last year CVS Caremark and Optum billed Medicaid managed care plans for $2.5 billion but paid out only $2.3 billion to pharmacies. "Pharmacists take aim at benefit managers" originally appeared in Crain's New York Business.